Like most kids, Felix knows what he likes. He spotted a new 'old school' bike outside his school and was rather determined to have one just like it. Colourful beach cruisers are all the rage if you're a teenage girl and if you're a boy between 7 and 15-ish, these retro style bikes are 'must haves'. New ones cost between 2500-3000 DKK - [€330-€400], whether they are Raleigh or Schwinn or whatever. He also knows what pose to strike whilst seated up the Chopper. 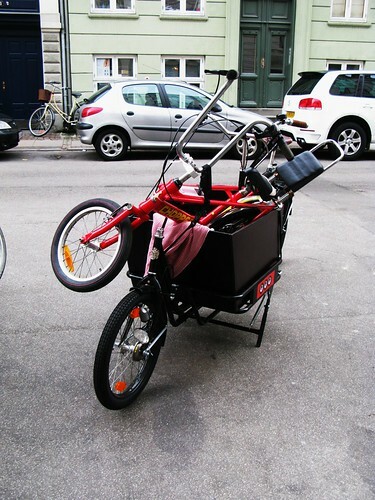 The bike above, however, was rescued from a bike auction by my mates at Baisikeli, who send used Danish bikes to Africa. It's a Raleigh Chopper, which Raleigh started reproducing in 2004, after 25 years. I used to have one just like it in the mid-1970's so I'm loving it that the Boy was itching for one, too. Not to mention the fact that I didn't have to fork over 2500 kroner. What better way to get it home than strapping it onto my Velorbis Long John. Felix will have to grow into the Chopper - shouldn't take long - but he already zips around the back yard. He has another bike for everyday use but he's looking forward to cruising the bike lanes on the Chopper. This is a great post with tender family influence. This is very good when kids are accustomed to bicycles. Kids grow, bicycle models change... So, simple! If possible, tell me (or give a link) more about the rules on bike lanes for kids. At what age can they start driving along the lanes without parents or..? 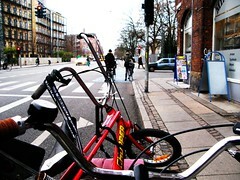 kids in Denmark can ride unattended on the bike lanes from the age of 6. it's the lowest age limit in the world. although i don't know any parent who lets them at that age, but it shows how cycling is an integral part of childrens' lives here. guidelines for cycling with your kids - not laws - are ride behind your child on the bike lane, not next to them [blocking bike traffic] although scoot up next to them at the red lights. kids are allowed to ride on the sidewalk when young, with the mum or dad riding on the bike lane next to them. my boy has been riding to daycare / school with me since he was 3 and a half and with training wheels. He ditched the training wheels when he was four and a bit. Felix is one cool dude, but I already knew that :). Denis, alright, you too Mikael *smile*, there's no age limit for kids on bike lanes in Amsterdam/NL, as it's up to the parents when they feel their youngsters are ready to ride with them. To give you an idea how that works in a busy, dense, bike crazy town, I point you to this, this and this and this picture. Generally, it helps that families make sure their kids learn to ride as early as possible and schools provide riding lessons/instructions from police men. Moms and dads will keep their young on the inside of the lane, or let them ride up front, while giving instructions when needed (for instance when there's bike traffic coming up from behind, making sure the kid stays to the right of the lane, or giving directions etc). This is completely accepted by other riders and they will be mindful. This all is only possible because everything has been provided in terms of infrastructure, liability, education and awareness. Other than that, it's just a no-brainer and a 'no biggie'. Way cool bike, dude! All it needs is a surf board attachment! My three year old has one of those pedal free wooden push bikes. Children here are allowed to ride on residential sidewalks, so I break the rules a bit and ride my bike with him through the neighborhood. He's been able to ride with me about 6.5 kilometers at a time, down to the bike shop and back. He is great at stopping at intersections and avoiding people and obstacles. People stop their cars to watch him, which cracks me up. Get 'em young! 1977,my friend Neal attempted jump 5 of us lying down in a row while riding a raleigh chopper. It seems obvious now that a raleigh chopper was never designed to get air but when you are 7 years old and think Evil knievel rules you have to have a go. I still remember the pain of a raleigh chopper landing on me. Fantastic times. At the risk of sounding like an old fart . 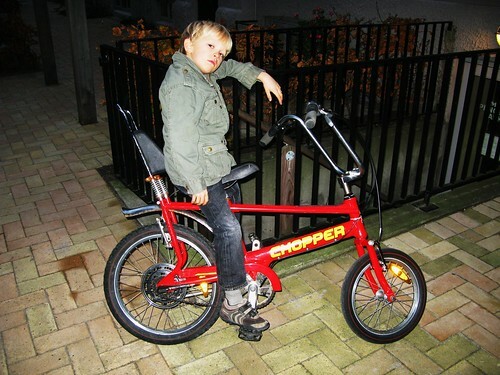 . . Raleigh Choppers were much better when I was a kid. They had a stick-shift for the gears. This was perfect for acting really cool - right up to the point where you braked too quick, or just slipped off the front of the seat (cos there really wasn't room for three of you on there), and came into contact with the gear lever. At that point, it became a real pain in the bum - or close to there, anyway! I can see that the new design may well be an improvement, and I'm dead jealous of Felix. Not least of all, because I wasn't actually allowed a Chopper first time round. I had to have a 'sensible' bike instead. Denis - For the law in the UK (bearing in mind that I'm not a lawyer, and don't even play one on TV), there's nothing to stop kids riding on the road. Appropriate training (like BikeAbility) is a seriously good idea, as the cycling infrastructure and critical mass of cyclists (note the lower case) just isn't there - people need to ride with a mix of defensive and assertive behaviours. It is, however, illegal for anyone over 11 (might be 12?) years old to ride a bike on a footpath or pavement that's not a designated cycle way too. Mikael, Marc and all - thanks for the detailed replies. We have a slightly different situation in Ukraine and Sevastopol in particular. According to the general rule, kids are allowed to ride on roads from the age of 14, but in reality miliciya (police) don`t allow them to do that, recommending them to ride on the sidewalk with the moderate speed. No need to say that they must wear helmets and have front\rear lights on their bicycles. The fine for riding without helmets and lights is UAH58(UAH6.50=USD1.00). These rules fall on adults also, but with riding on roads :-). In Sevastopol the situation is better. Fines are not taken from kids and their parents. The explaination to ride accurately is given in the form of a kind recommendation. The most important thing is - not to be a speedy supersonic on the sidewalks. This is the difference between Ukraine & Sevastopol. I loved those old Hot Rod banana seat bikes. They were so cool. But then BMX bikes came around and we ditched the Hot Rods to catch some "air". Never landed on a friend BTW. Usually cleared all of them by 10 ft! No Joke! Andy, do you remember Raleigh grifters? A friend in our close got one and we were all jealous but then BMXs came along and you couldn't give one away. I also remember the craze of turning your racer handle bars so they stuck up. If you were really cool you could do wheelies all the way down the road next to the estate. We never had helmets, knee pads, shin guards etc, and we all survived. I feel sorry for kids today.